Karunanidhi said that it has given hope for the Tamils in the island nation. 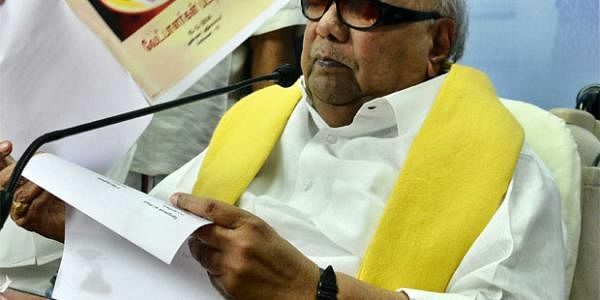 CHENNAI: DMK President M Karunanidhi welcomed the appointment of Tamil National Alliance leader R Sampanthan as the Leader of Opposition in Sri Lankan Parliament, saying it has given hope for the Tamils in the island nation. "Sampanthan being elected Leader of the Opposition at a time when Tamils were for long looking forward to a resurgence gives us all hope," he said in a statement here. Greeting the Tamil leader on his being chosen for the important post, he said, "Sampanthan has said that the TNA would strive for getting Tamils their rights and powers and it gives joy." "It is joyous that a Tamil has become Leader of the Opposition in Sri Lanka after a gap of 38 years," he said. Sampanthan heads the TNA sine 2001 and he has been a Member of Parliament for more than 22 years. TNA comprises Ilankai Tamil Arasu Katchi (ITAK), Tamil Eelam Liberation Organisation (TELO), the Eelam People's Revolutionary Liberation Front (EPRLF) and the People's Liberation Organisation of Tamil Eelam (PLOTE).